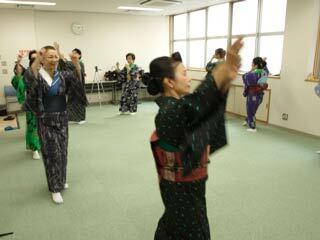 Tohoku Ondo (東北音頭) is popular Bon Odori Song of Tohoku region. It is normal speed and simple move. Face to the direction (counter clockwise). Grab hands lightly, and raise them up and open to right side. Step right foot. Do the other side, 4 times in total. Step back, right and left, with Awasete (palms always face each others). First step right foot and drop. Put your hands together at right shoulder. Step left foot and up. From the left low, walk forward and clap, clap and beck. Step right and beck together. Move forward and swing your arms from down to up twice. Step right foot and draw Mt. Fuji. Step back the right foot and clap. Step left, right and left. Put feet together. Clap at each steps.